Our cat care clinic in Washington requires full payment at the time services are rendered. For your convenience, we accept Visa, MasterCard, cash, personal checks, CareCredit® and Sunbit®. We're pleased to offer our clients CareCredit Convenient Monthly Payment Plans. 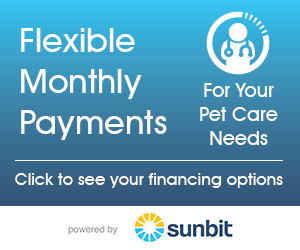 With CareCredit you can say yes to the best treatment for your pet immediately, and pay for it over time with low monthly payments that fit easily into your budget. We offer CareCredit's 6 month no-interest plan (no-interest applicable only if charges are $200 or more and amount is paid in full by the required due date). If you would like to learn more about CareCredit, please click on the link below. If you are ready to apply for CareCredit, please click on the link below, it will take you to the application page.